I just saw Orion shining for a moment amid black clouds and a raging wind. I thought first of my vanity, in comparison with those suspended worlds. Then I thought of justice, of friendship, of the divine sentiments engraved on the heart of man, and I no longer found anything great in the world save man and his Creator. This idea impresses me. Can it be that He does not exist? Can chance, by combining certain elements, have created the virtues reflections of an unknown grandeur? If chance had made the universe, what would conscience, remorse, and devotion signify? Oh, if you can believe, with all the strength of your being, in that God who invented duty, your indecision will be settled. For admit that it is always this life fear for it or for your comfort that troubles the fleeting days, which would pass peacefully, if, at the end of the journey, you saw the bosom of your Heavenly Father waiting to welcome you. I must leave this to go to bed but I have dreamed most pleasantly. 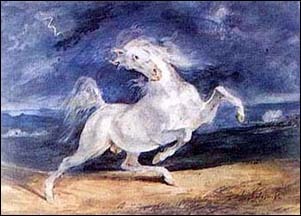 I see some progress in my study of horses. 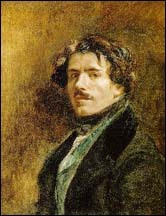 "Delacroix: French Romantic Art" (Laura Katajisto) | "Delacroix: Portrait of a Master" (Art Lovers' Paris) | "Delacroix: Classicist or Romanticist"